Optimize hidden Windows settings for more speed. 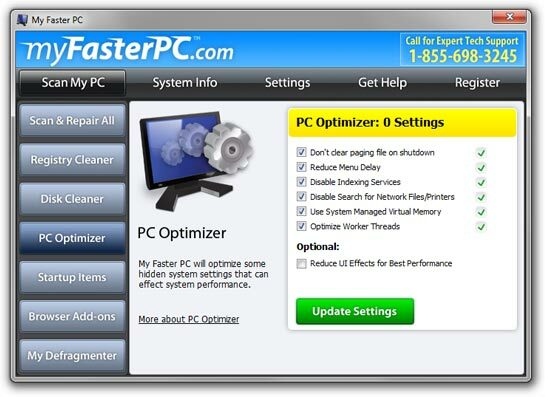 The PC Optimizer tool finds settings that can be tweak for improved speed and performance. Many of these settings are hidden deep in the Control Panels or Windows registry, where only experts know to look. My Faster PC will automatically check your configuration to see if any settings can be adjusted to boost performance. You might see an immediate speed benefit after using the PC Optimizer, but results will vary based on your operating system, computer age, and overall hardware performance. If your PC is old or underpowered, you may want to try turning on "Reduce Visual Effects" to decrease resources required by Windows Explorer. Some changes not be active until you restart your computer as well. Don't clear paging file on shutdown: The paging file is an extension of your PC's physical memory. If you don't have enough real memory installed, your computer will create a paging file on your hard drive to hold this extra data. Usually, when you shut down, the paging file is deleted. By turning this setting off, you can help speed up shut down time. The paging file will be written over when your computer next accesses it. Note: If you access highly secure data on your PC, you may not want to disable this setting. Reduce Menu Delay: This setting can help speed up your Start Menu's performance by removing the built-in delay. Disable Indexing Services: This setting can help speed up system performance by turning off the indexing service that crawls through all your files to create a search index. In Windows 7 and Vista, this setting won't turn off indexing for your Start Menu, which can actually speed up menu performance. Disable Search for Network Files/Printers: This setting can help your Explorer windows open faster when browsing files by turning off a process that can slow down window performance. Optimize Worker Threads: This setting will optimize the number of system worker threads for better overall performance and multitasking. Reduce Visual Effects: This optional change can be turned on manually to reduce the visual effects used by Windows. In cases with serious performance problems, turning this on may help you get some extra juice out of your PC. This setting will disable the Aero interface for Windows 7 and Vista, so your interface may not look as nice as before, but it should work faster. In general, if you have less than 1GB of memory and are using Windows 8, Windows 7 or Vista, you may want to consider turning this on to see if it helps.